Unless TSA agents have confiscated my food bags in some underhanded attempt at mind control, or my bag mysteriously disappears into the abyss that is the seat pocket, I never, ever consume airline food. Packed with sodium and preservatives, airline meals are never a memorable event. Mostly you find yourself playing the role of an investigator, sleuthing through the contents of your tray–all the while wondering if that misshapen blob hidden beneath a layer of opaque sauce is indeed chicken. Ignore the lies the flight attendants tell you. It’s never chicken. Many of my friends make poking fun of my food bag a national pastime, however, invariably, they’ll crave a piece of my homemade cookie, beg for a carrot, or express heartbreak over not bringing aboard an almond-crusted chicken of their own. For international flights, I tend to pack a carry-on filled with snacks, a proper meal, fruits and cut vegetables. I also pack a couple of bars for when I’m walking around all day or I’m in a pinch between European meal times. And over the past year, I’ve booked AirBNB apartments so I have the option of either dining out or cooking up a dish with local ingredients from the market. Today I’m leaving for Spain, and to say that I’m jubilant is an understatement. I AM OVER THE MOON. Two weeks without the company of people is glorious, and I intend to trek to Dali’s house and museum and eat all the gluten and dairy free tapas a woman can endure in one sitting. I’m all packed (one small rolling bag, a purse and one carry-on bag), with the small exception of gathering some fruits (apples, raspberries + blackberries) + cut veg (carrots, edamame) for the flight. The contents of my food bag are abundant. I tend to overpack because you just never know if your flight might be diverted and you end up having an Odyssean layover in some airport where the main culinary attraction is the rotating hot dog (Exhibit A: Fiji’s airport). 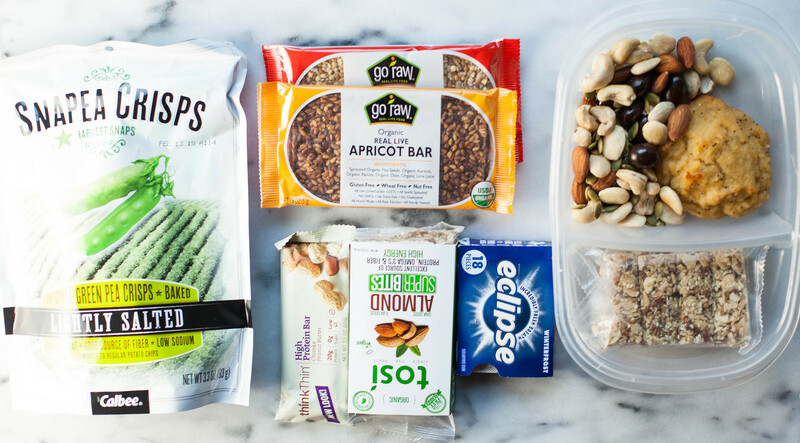 I focus on GMO + gluten-free snacks that pack a protein punch, teas, nuts, fruit, vegetables, treats (my lemon poppyseed cookie + some dark chocolate-covered almonds), as well as packing a full meal. 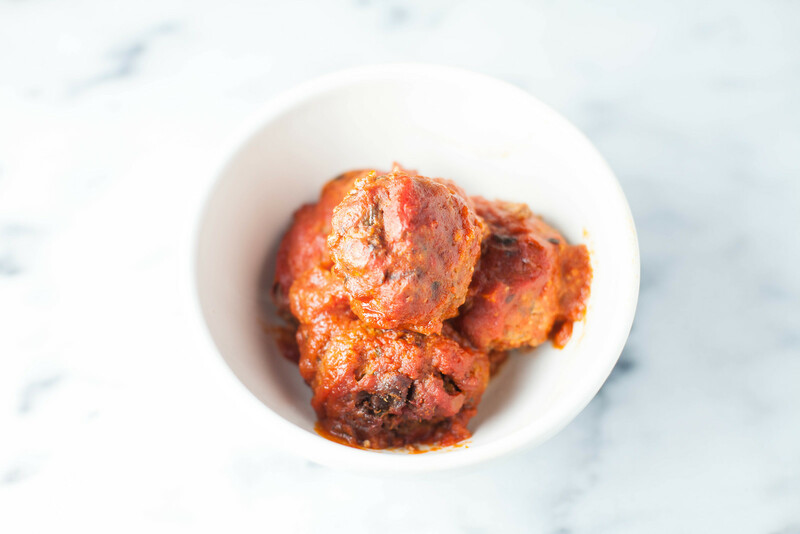 Today, I’ve got these DELICIOUS sundried tomato meatballs, which are just as good at room temperature versus heated, and I plan to pick up a plain green salad at JFK. I always check the food options at the terminals in advance of my flight. Most places will sell a simple green salad. 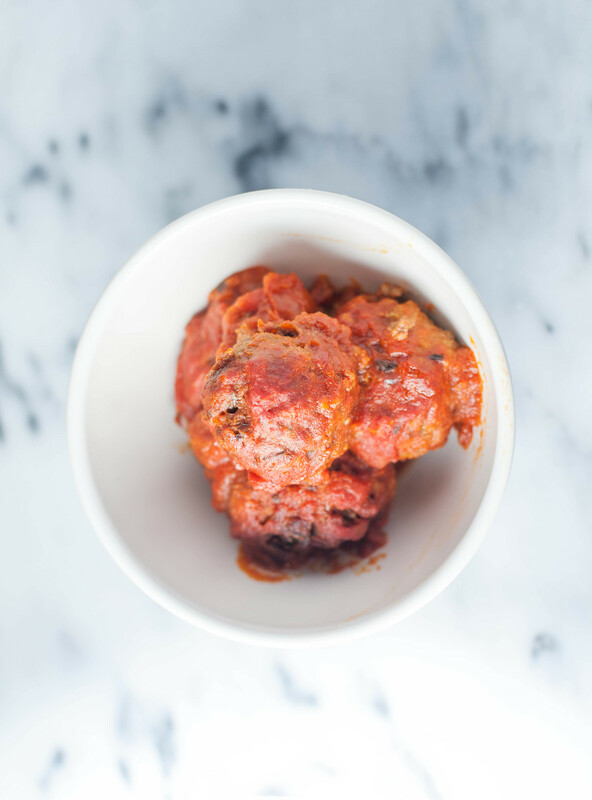 Want to make these meatballs? Super simple. 1 lb ground sirloin | 1/2 cup sundried tomatoes | 2 tbsp parsley | sprigs of rosemary | 1 egg | salt/pepper. Blitz the sundried tomatoes, parsley, rosemary, salt and pepper in a food processor/blender. Add the mixture + egg to the meat, mixing with your hands, gently. Shape into meatballs. Add them to a large oven-proof baking dish. Cover with your favorite tomato sauce and cook at 400F for 25 minutes. This post was inspired by my friend Hitha, and her enormous propensity to make travel simply luxurious. I’m ecstatic that you shared this! Not only have you inspired me to step up my own in-flight food game (which is pathetic right now), you also have me salivating over those meatballs! They look incredible and I’m sure they taste even better. WHAT? I feel like your food game would be so on point. Although I did chuckle when I heard you talk about the Nathan’s cheese fries in your recent video. I’m flying tonight and the only thing saving me from not hitting Shake Shack is the fact that I can’t eat the BUN or the CHEESE on the burger. WAIL. Great post! I am always looking for healthy snacks to stash for airplane rides 🙂 In fact, I am taking one this week to Santa Barbara… and those go raw bars will be in my bag! That recipe seems so simple but really good! All of those foods that you take with you on your trip also look way better than the foods at the terminal, I usually feel like I don’t know what I’m actually eating. So true, right? Even the salads look suspect. You’re so right about the chicken! Every single time I spend a good five minutes examining the contents of the tray that they plonk down in front of you. This post has definitely inspired me to be more organised! Have an amazing time in Spain! I’m like you, and all about bringing a whole selection of great food for flights. I love pulling out my delish food when everyone else is peeling off the lids to their gross in-flight meals. My husband and I are addiiiiiiicted to those damn snapea crisps. Though the, uh, less healthy flavors… ahem. LOL. I’m happy to spread the word. The last thing I want is this space to EVER focus on generating revenue 🙂 Warmly, f.
Gotta try those meatballs! Yum!